A pair of unique and colorful structures, making a statement in Miami’s Edgewater neighborhood for decades, is being considered for placement on the National Register of Historic Places. The city commission is to consider a resolution today (5/10) to support the nomination of the Bacardi Buildings Complex. The city commission earlier this year took the same action in regard to historic Miami Marine Stadium, which was added to the National Register last month. The Bacardi Buildings Complex at 2100 Biscayne Blvd. has been a locally protected historic resource since Oct. 6, 2009, when it was designated by unanimous decision by the Historic and Environmental Preservation Board. Also, the property is less than 50 years old and, while the Bacardi complex was created in 1963, the administration building was constructed in 1973, but contributes to the significance of the complex because it follows many of the same design principles and influences as the original parts of the Bacardi complex. Since acquiring the historic Bacardi complex in 2012, YoungArts has been working to transform the campus into a multidisciplinary cultural center while preserving its beloved structures, according to the foundation. Located on the easternmost side of the plaza facing Biscayne Boulevard, the tower was commissioned by former Bacardi president José “Pepin” Bosch and houses the YoungArts Gallery, Ted’s at YoungArts and staff offices. Designed by Cuban architect Enrique Gutierrez of Saenz, Cancio, Martin and Gutierrez, the tower comprises a rectangular seven-story structure, which appears to float weightlessly over a square glass pedestal at the plaza level, the website says. Keeping the tower company in colorful fashion is the building known as The Jewel Box, designed by Ignacio Carrera-Justiz of Coral Gables. The exterior is covered in thick hammered stained glass tapestries, designed by S.E.A.R. under the direction of Gabriel and Jacques Loire of Chartres, France, based on an abstract painting by German artist Johannes Dietz. 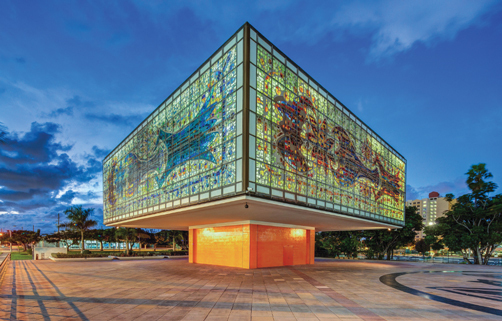 “The Bacardi buildings are iconic examples of mid-century modern International-style architecture, notable for their uses of steel and glass, each featuring imaginative cantilevered overhangs as the bulk of the building … The buildings are notable for the way that they embrace international influences within architecture and art to create visually impressive works,” the report reads.